Governors Island is New York’s greatest new park. Now it has its own guide book. 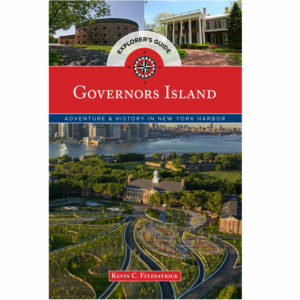 The Governors Island Explorer’s Guide was published by Globe Pequot Press on February 15, 2016. The book is part of the “Historical Tours” series. It is 144 pages and available in softcover and ebook. It is lavishly illustrated with eight maps, 100+ photos, and artwork. The book is distributed through National Book Network and orders can be placed through them. Eastern National distributes the book in the bookstore on Governors Island. It can be found in bookstores, all online retailers, and special orders from any bookstore. More ordering information is below. This is the first (and only) guide book written just about the Island. It follows the work my friend Janice Taylor and I started in 2010 with the first iPhone app for Governors Island. As the island changed since the app came out, I worked on updates and collecting material for the new book. Since I am a licensed New York City Sightseeing Guide as well as a published author, I wrote a book that I believe will be informative, educational, researched, and most importantly, useful. If you have questions about the book, please drop me a note.